A list of Kickstarter rewards for the planned Wasteland 2 sequel is being kicked around right now at inXile's official Wasteland Chronicles website. First things first: Did anyone here know that this Wasteland 2 website even existed? I had no idea, and I feel kind of embarrassed about that. The first blog post is just a few days old which takes a bit of the sting out of it but still, this seems like the sort of thing I should be aware of the second it happens. In any event, it's there, it currently contains a single blog post from Brian Fargo talking a bit about the history of the game and what's planned for the sequel, and more importantly there's a forum where a surprising amount of discussion is going on, including some talk about what Wasteland 2 Kickstarter supporters can expect for their money. At the $15 start level, supporters will get a copy of the game on Steam plus a special skill and weapon available only to those who donate. $30 gets the same, plus a copy of the soundtrack, while $50 brings with it a full, large boxed edition of Wasteland 2 with a cloth map and "old school comprehensive instruction manual." And then it gets serious. For $100 you'll get all the above plus the collector's edition of the game, which will include premium packaging, a Wasteland miniature, Wasteland 2 faction badge and your name in the credits. $250 means your CE box will be autographed by Brian Fargo, Alan Pavlish, Mike Stackpole and the gang, a "real" [as in, not in-game] Desert Ranger medal of honor and a limited edition, numbered collectible coin. $1000 bucks gets you in the game; $2500 bucks brings home a signed and numbered exploded blood sausage. Got $10,000 to spend? That's all of the above plus a whole bunch of extra stuff, 50 copies of the game to do with as you please and an invite to a party in California with Fargo, Pavlish and other "key members" of the team. The Kickstarter rewards aren't yet carved in stone, so you still have a chance to jump into the conversation and let them know what you think. 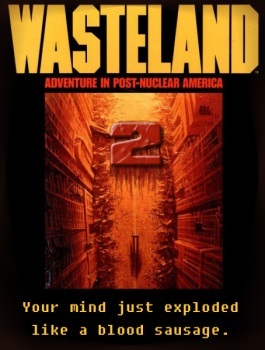 A few changes have already been made, including the addition of a Wasteland 2 poster and digital concept art book to various levels of support; the team also clarified that the supporter weapon and skill "will absolutely be entertaining" but won't throw the game out of balance, and the whole thing [in case it hasn't been mentioned before] will be DRM-free.